"This is an orange flavored gingerbread for the bread machine that is especially good with chocolate syrup or hazelnut spread." Place ingredients into the bread machine in the order recommended by the manufacturer. Select the Dough cycle, and press Start. When the machine signals the end of the cycle, remove the dough. Roll into a loaf, and place in a 9x5 inch bread pan. Set aside to rise until doubled, or until your finger leaves a dent when the dough is pressed lightly. Preheat the oven to 350 degrees F (175 degrees C). 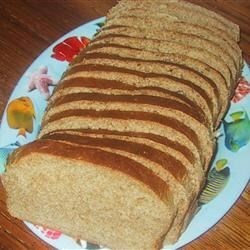 Bake the bread for 25 minutes in the preheated oven, or until a rich golden brown. I like this bread, but I don't love it. I would make it again because I have not found many breakfast breads. I think it would make good french toast. Great tasting bread! The orange and the ginger really come through! This loaf slices nicely! Thanks for the recipe! I used this recipe as the basis for my adaptation of Christopsomo (Greek Christmas bread) to my bread machine. I added spices, raisins & nuts and VOILA! Christopsomo.